The Celestron 21008 is a PowerSeeker 40AZ telescope with fully coated glass optical components and high transmission coatings for enhanced image brightness and clarity for viewing the moon, planets, meteor showers and brighter deep-sky objects. It features Altazimuth mount make setting up the telescope to fine adjustments for precise positioning. This telescope have a multi-coated 2x Barlow lens that doubles the magnification of each eyepiece for detailed viewing. 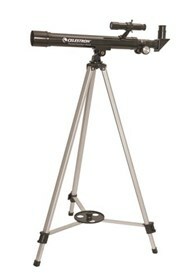 The Celestron 21008 features Erect image optics ideal for terrestrial and astronomical use.